This trip was planned as a scout for some upcoming Manu Expeditions Birding trips to the country. We did not look for some species we would look for on future tours, as this was very much a scouting trip with limited time. Colombia has come a long way in answering its security questions and the time is was ripe to visit this bird rich country with the help of the NGO ProAves. ProAves is a Colombian NGO dedicated to the conservation of birds and their habitats. They own a superb network of 11 reserves totaling over 10,000 hectares, protecting critical habitat for many of Colombia’s threatened and endemic bird species. ProAves also invests a lot in ornithological research, in order to improve our knowledge of Colombia’s avifauna and to identify new target areas for reserves. They don’t neglect environmental education either, and their mobile environmental classroom, called the Loro Bus (“Parrot Bus”), is known throughout the country. Their countrywide campaign against the cutting of the wax palm tree for religious ceremonies went a long way towards saving the Yellow-eared Parrot from extinction and they continue to buy land to conserve extremely range restricted birds and on this trip, as for future trips we will stay at their accomdations at the reserves. Colombia – one of the two most diverse countries for birds on the planet along with Peru (which it narrowly outstrips due to records of migrants and vagrants on the San Andreas Island in the Caribbean). North of Ecuador the Andes branches into 3 distinct mountain chains, separated by the Cauca and Magdalena valleys, each with its endemic avifauna. The Santa Marta mountains rise, it seems, straight out of the Carribean and is a spectacular mountain range with a hatful of localized endemics. Mention of Colombia conjures images of Emeralds, Coffee, Vallenato music, Guerillas and Cocaine and indeed like many developing countries Colombia is in flux. We made no excuse for concentrating on endemics in the Colombian Andes, and the trip did not concern itself with common coastal and Amazonian birds, though on the route we took we did not ignore anything that popped up in front of us. This trip report is based on visits to reserves that protect the last remaining forests and habitats of some of the most endangered birds in the world. We recorded 40 Colombian endemics, many endangered, some critically. Barry Walker on this trip got around 60 new birds despite 25 years birding the Andes, many endemics, and he had seen all the Santa Marta endemics previously. June 15th - 17th Reserva Natural de Aves Reinita Cielo Azul (Cerulean Warbler Reserve) Department of Santander. 1300-1900 meters. June 24th – Early morning around El Dorado Lodge and then drive to Santa Marta for flights home. Great Egret - Ardea albus: We saw small numbers at several wetland sites. Now usually placed in the genus Ardea. Striated Heron Butorides striatus: Small numbers seen at several wetland areas. Cattle Egret Bubulcus ibis: Common and widespread. Capped Heron Pilherodius pileatus: We had nice looks at the Paujil reserve. Black-bellied Whistling-Duck Dendrocygna autumnalis: Ten near Puerto Pinzon. American Swallow-tailed Kite Elanoides forficatus: One of the most elegant birds of the Neotropics. 10+ at the Paujil reserve. Roadside Hawk Buteo magnirostris: Numerous and widespread in small numbers. White-rumped Hawk Buteo leucorrhous: We saw three on consecutive dates at San Lorenzo in the Santa Marta mountains. seen regularly in small numbers. American Kestrel Falco sparverius: Scattered sightings. Marbled Wood-Quail – Odontophorus gujanensis 2 seen at the Paujil reserve. Southern Lapwing Vanellus chilensis: Fairly widespread in small numbers. Band-tailed Pigeon - Columba fasciata: Fairly common and widespread with many good views of perched birds. One of the most widespread New World birds, ranging from Alaska to Argentina. Here the Neotropical form albilinea, which has been regarded by some authors as a full species. Pale-vented Pigeon - Columba cayennensis: A few at the Paujil reserve. Eared Dove - Zenaida auriculata: Common. Common Ground-Dove - Columbina passerina A few here and there. Ruddy Ground-Dove - Columbina talpacoti: Numerous and widespread in open country. White-tipped Dove Leptotila verreauxi: Pretty common at many localities. Red-bellied Macaw Ara severa: 4 at Serrania las Quinches. Scarlet-fronted Parakeet Aratinga wagleri: Quite numerous in the lower reaches of the Santa Marta Mountains. Here the nominate race. Species in this genus, as well as Leptosittaca and those in Pyrrhura, often go by the name ‘conure’. Spectacled Parrotlet Forpus conspicillatus: A near-endemic that showed well in the coffee plantations at RNA Reinita Cielo Azul. Blue-headed Parrot Pionus menstruus: A few at Los Quinches. the endemic race saturatus. A species conspicuously absent from most of the remainder of the country. Squirrel Cuckoo Piaya cayana: Regular encounters, with a total of eight noted during the tour. Striped Cuckoo Tapera naevia: Heard on a few occasions and seen very well once. White-tailed Nightjar - Caprimulgus cayennensnis. - One seen pre-dawn at RNA Reinita Cielo Azul. Chestnut-collared Swift Streptoprocne rutilus: Small numbers noted at a few locations. Long-billed Hermit Phaethornis longirostris: This is the form that occurs in Central America as opposed to the one along the coast of Ecuador and extreme north Peru (“Baron’s Hermit”) Ridgely & Greenfield (2001) considered the subspecies baroni of western Ecuador and northwestern Peru to deserve recognition as a separate species from Phaethornis longirostris based on vocal and plumage differences. SACC proposal to recognize baroni as a separate species did not pass. Pale-bellied Hermit - Phaethornis anthophilus: A single seen at the El Paujil reserve. Sooty-capped Hermit - Phaethornis augusti A couple in the Santa Marta mountains. Lazuline Saberwing – Campylopterus falcatus One seen repeatedly at the Recurve-billed Bushbird Reserve, A spectacular ranhe restricted species. Green Violetear Colibri thalassinus: Seen above Ibague and then on the San Lorenzo Ridge ‘Thalassinus’ is Latin for ‘sea green’. Sparkling Violetear Colibri coruscans: Relatively scarce with just 2 in the Santa Marta mountains. mountains around Minca and above Ibague. Species limits in the mellisugus group of taxa in Chlorostilbon are complex. At one extreme, Zimmer (1950d) and Schuchmann (1999) considered them all conspecific, including the canivetii group of Middle America. Chlorostilbon gibsoni (including nitens) was usually (e.g., Cory 1918, Peters 1945, Meyer de Schauensee 1970) considered a separate species ("Red-billed Emerald") from C. mellisugus, as was C. canivetii. Stiles (1996a) proposed that C. mellisugus should be treated as at least three separate species within South America: melanorhynchus (of western Colombia and Ecuador), gibsoni (northern and central Colombia, NW Venezuela), and mellisugus (rest of South America); this represents a partial return to the classification of Cory (1918) and was followed by Ridgely & Greenfield (2001). Together, these taxa would form a superspecies with recently described olivaresi. Sibley & Monroe (1990) considered C. mellisugus to form a superspecies with Middle American Chlorostilbon species but not with C. gibsoni, because the two were thought to be sympatric [are they? breeding?] in the Magdalena Valley, Colombia. SACC proposal passed to follow species limits proposed by Stiles (1996a). Rufous-tailed Hummingbird Amazilia tzacatl: This common and widespread species was seen in small numbers. Speckled Hummingbird Adelomyia melanogenys: Fairly common at the Cerulean Warbler Reserve. Mountain Velvetbreast Lafresnaya lafresnayi: One in the Santa Marta mountains. Andean chains, and the very distinct and blue-tailed districta, endemic to the Santa Marta and Perijá mountains. White-tipped Quetzal Pharomachrus fulgidus: Superb views of several birds in the San Lorenzo area. One of the species shared between the Santa Marta Mountains and Venezuela’s coastal cordilleras. Western White-tailed Trogon Trogon chionurus: Two at the El Paujil Reserve Formerly lumped in Amazonian White-tailed Trogon T. viridis, Western White-tailed. The South American Checklist committee says “Ridgely & Greenfield (2001) considered the subspecies chionurus of the Chocó region to be a separate species from Trogon viridis; followed by Hilty (2003); SACC proposal to recognize this split did not pass because of insufficient published data. This Trogon ranges from Panama into western Ecuador. Masked Trogon Trogon personatus: A highland version of the former and it was partuclarly common in the Santa Marta Mountains. Northern Violaceous Trogon Trogon caligatus: Several at the El Paujil reserve. The SACC says “Ridgely & Greenfield (2001) considered caligatus of Middle America and northwestern South America to be a separate species from Trogon violaceus, and this was followed by Hilty (2003); SACC proposal to recognize this split did not pass because of insufficient published data. now often treated as part of a separate family, the Cerylidae. Suiza. The SACC says - Momotus momota may consist of several species-level taxa (e.g., Ridgely & Greenfield 2001). The subspecies aequatorialis, venezuelae, subrufescens, microstephanus, and argenticinctus were all formerly (e.g., Ridgway 1914, Cory 1919) considered separate species from M. momota, as were two Middle American taxa. Chapman (1923) recognized four species in South America: M. subrufescens (including "venezuelae") of the Caribbean rim of northern South America, M. bahamensis of Trinidad, M. aequatorialis of the Andes, and M. momota (including microstephanus) of the rest of South America, including argenticinctus of western Ecuador and northwestern Peru. Peters (1945) considered them all conspecific, and this was followed by Meyer de Schauensee (1970) and AOU (1983, 1998). Fjeldså & Krabbe (1990) proposed that the Andean form aequatorialis was a separate species from M. momota, and this was followed by Ridgely & Greenfield (2001) and Dickinson (2003), thus returning to the classification of Cory (1919) and Chapman (1923, 1926). However, no formal analysis has ever been published, and the published evidence in support of treating aequatorialis as a species-level taxon is weak. SACC proposal passed for treating aequatorialis as conspecific with M. momota (and we hope that this decision stimulates further research on the M. momota complex). Yellow-billed Toucanet Aulacorhynchus calorhynchus: At Santa Marta. The taxon calorhynchus was formerly (e.g., Cory 1919, Peters 1948, Phelps & Phelps 1958a, Meyer de Schauensee 1970) treated as a separate species ("Yellow-billed Toucanet") from Aulacorhynchus sulcatus, but in their area of contact in Venezuela, only individuals with intermediate bill characters are found (Schwartz 1972b); still treated as separate species by Hilty (2003). Citron-throated Toucan – Ramphastos citrolaemus Heard commonly and one seen at Serrania de los Qinches. The SACC says - Cory (1919) and Meyer de Schauensee (1966, 1970) considered R. culminatus ("Yellow-ridged Toucan") and R. citrolaemus ("Citron-throated Toucan") as separate species from Ramphastos vitellinus. Haffer (1974) treated these as a subspecies of R. vitellinus, and this treatment, actually a partial return to the classification of Pinto (1937) and Peters (1948), has been followed by most subsequent authors (but not Sibley & Monroe 1990, Hilty 2003). Black-mandibled Toucan Ramphastos ambiguus:Seen daily at Serrania de los Qinches. females of other races), whereas the female lacks the red altogether. E Beautifull Woodpecker - Melanerpes pulcher – 2 seen very well at the El Paujil Reserve. A Colombian endemic. The SACC says “The Colombian taxon pulcher was considered a separate species from Central American Melanerpes chrysauchen by Cory (1919), Eisenmann (1955), and Stiles & Skutch (1989); however, Peters (1948) treated them as conspecific, and that treatement has been followed by most subsequent authors (e.g., Meyer de Schauensee 1979, Short 1982, Hilty & Brown 1986, Winkler et al. 1995, AOU 1998, Winkler & Christie 2002, Dickinson 2003). Wetmore (1968) provided rationale for treating pulcher as a separate species, as noted by Meyer de Schauensee (1966), but this has not been followed by most subsequent authors. SACC proposal passed to recognize pulcher as separate species. Spot-breasted Woodpecker – Colaptes punctigula Colaptes atricollis, C. punctigula, and C. melanochloros were formerly (e.g., Cory 1919, Pinto 1937, Peters 1948, Phelps & Phelps 1958a, Meyer de Schauensee 1970) treated in a separate genus, Chrysoptilus, but Short (1965, 1972a, 1982) merged this into Colaptes. However, plumage similarities of these three species to Piculus suggests that further study may reveal a closer relationship to that genus ; in fact, recent genetic data with limited taxon-sampling suggest that Piculus and South American Colaptes are more closely related to each other than either is to North American Colaptes (Prychitko & Moore 2000, Weibel & Moore 2002a, b; see also Webb & Moore 2005). Ridgely & Greenfield (2001) and Hilty (2003) retained Chrysoptilus for punctigula only. 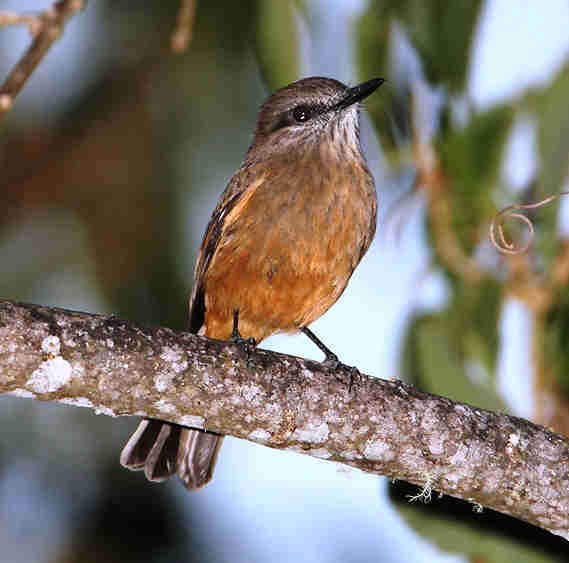 Slaty Spinetail Synallaxis brachyura : Seen very well in the Ibague area but not again. E Streak-capped Spinetail Cranioleuca hellmayri: Another localized spinetail (endemic to the Santa Marta Mountains and Sierra de Perijá) that showed very well indeed and was in the garden of lodge every day. E Santa Marta (Ruddy) Foliage-gleaner – Automolus (rubiginosus) rufipectus. A distinct endemic form found only in the Santa Marta Mountains seems to be a separate species but work on this is only now being done. Streaked Xenops Xenops rutilans: At Ibague and the Cerulean Warbler Reserve. The form found in the Central and Western Andes is heterurus. Olivaceous Woodcreeper Sittasomus griseicapillus perijanus A couple at the Cerulean Warbler Reserve. The SACC says “Sittasomus griseicapillus almost certainly consists of multiple species (Hardy et al. 1991, Ridgely & Tudor 1994, Parker et al. 1995, Ridgely & Greenfield 2001, Hilty 2003), with at least five subspecies groups possibly deserving separate species status (Marantz et al. 2003).” In Bolivia its viridis. In Manu Peru it’s amazonas, in the west of N Peru and Ecuador its aequatorialis, and in SE Brazil it’s sylviellus and there are more. Watch this taxon for splits. Northern Barred Woodcreepr – Dendrocolpates santithomae punctipectus* The SACC says Dendrocolaptes sanctithomae was formerly (e.g., Peters 1951, Meyer de Schauensee 1970) considered conspecific with D. certhia (Amazon Barred Woodcreeper), but Willis (1992) and Marantz (1997) provided evidence that they should be treated as separate species; they constitute a superspecies. Marantz et al. (2003) noted that the southeastern subspecies punctipectus might also deserve treatment as a separate species from Dendrocolaptes sanctithomae. Cocoa Woodcreeper – Xiphorynchus susurrans. Fairly common at various sites. The SACC says -The relationships among taxa included in Xiphorhynchus susurrans and X. guttatus are complex and need much additional work. Xiphorhynchus susurrans was formerly (e.g., Zimmer 1934d, Phelps & Phelps 1950a, Peters 1951, Meyer de Schauensee 1970) considered conspecific with X. guttatus, but Willis (1983) provided evidence that it should be treated as a separate species; this treatment was followed by Ridgely & Tudor (1994) and AOU (1998); they constitute a superspecies. Xiphorhynchus susurrans had previously been treated as a species by Cory & Hellmayr (1925), who also treated the subspecies polystictus (= sororius) as a separate species; this was considered conspecific with X. guttatus by Zimmer (1934d) and Peters (1951). However, Aleixo (2002) found that treating X. susurrans at the species level makes Xiphorhynchus guttatus paraphyletic with respect to Amazonian guttatoides group (Lafraneye’s Woodcreeper) of western and southwestern Amazonia (guttatoides, dorbignyianus, eytoni, and vicinalis) and eastern Amazonian guttatus group (guttatus, polystictus, and provisionally, connectens). Marantz et al. (2003) also emphasized that the current assignment of subspecies to either X. susurrans or X. guttatus does not correspond to the boundaries in vocalizations. Furthermore, the eytoni subspecies group was formerly (e.g., Todd 1948, Meyer de Schauensee 1966, 1970) considered a separate species ("Dusky-billed Woodcreeper") from X. guttatus; here it is treated as subspecies of guttatus following Cory & Hellmayr (1925), Zimmer (1934d), Pinto (1937), Peters (1951), and Ridgely & Tudor (1994), but Marantz et al. (2003) noted that this group differed in vocalizations from other taxa included in X. guttatus. Proposal needed? Straight-billed Woodcreeper Xiphorhynchus picus: Several seen in open country. Santa Marta mountains (the endemic sanctaemartae race). Black-backed Antshrike Sakesphorus melanonotus: Great looks at a male and female in the Minca area. Bar-crested Antshrike Thamnophilus multistriatus: Great views of birds above Ibague and then in the coffee at the Cereulean Warbler Reserve A near-endemic, generally replacing the previous at higher elevations (though the Barred we saw was above the Bar-crested!!). Outside Colombia only known from the Venezuelan side of the Sierra de Perijá. Uniform Antshrike Thamnophilus unicolor: Good looks and fairly common in the Cerulean Warbler Reserve. The subspecies in Colombia is grandior. E Parker’s Antbird Cercomacra parkeri: Recently described: Graves (1997).Took a bit of finding but eventually great looks at a pair at the Cerulean Warbler Reserve and heard there next day. One of the birds named for our late friend Ted Parker. Dull-mantled Antbird - Myrmeciza laemosticta - A pair responded splendidly to playback at the El Paujil reserve. Rusty-breasted Antpitta Grallaricula ferrugineipectus: We enjoyed fantastic views of a tame pair in the Santa Marta mountains. Ridgely & Tudor (1984) suspected that G. ferrugineipectus might consist of more than one species. Krabbe & Schulenberg (2003a) indicated that vocal differences suggest that the southern subspecies leymebambae deserves recognition as a separate species. this one into view were unsuccessful. Marta endemic, beautifully showing its little white crown patch has it scurried along in the open for us. Marta Tapaculo at higher elevations, that we saw very well above San Lorenzo. Marta Mountains. Here the race decora, endemic to this mountain range. Yellow-headed Manakin – Xenopipo holochlora. A big surprise to see this loclaized near enedemic above Ibague. Xenopipo flavicapilla is locally distributed in south-west Colombia, where it is known from both slopes of the West Andes, in Cauca and Valle del Cauca, the west slope of the north Central Andes in Antioquia, and at the head of the río Magdalena valley in Huila. It also occurs on the east slope of the Andes in west Napo and, at least formerly, Tungurahua, Ecuador. It is patchily distributed and rare to uncommon in suitable habitat. There are relatively few recent records, though it is very inconspicuous and perhaps overlooked2. It is confined to the lower growth of montane forest and mature secondary woodland, at 1-8 m up in vegetation, occasionally associating with mixed-species flocks. Much of its range is within prime agricultural land, some of which has already been cleared, and the rest is probably threatened. Xenopipo holochlora, was formerly (e.g., Hellmayr 1929, Phelps & Phelps 1950a, Meyer de Schauensee 1970) placed in a separate genus, Chloropipo; for its merger into Xenopipo, see Prum (1992); they were considered to form a superspecies by Snow (1979c). Western Striped Manakin Machaeropterus striolatus: Good looks at an obliging female at the El Paujil reserve, here of the endemic race antioquiae (named after the Antioquia Department, in the eastern part of which Rio Claro is located, and of which Medellín is the capital). with your ears than your eyes. Seen and heard at serrnaia de los Quinches. Venezuelan Tyrannulet – Zimmerius improbus – A couple at lower elevations in the Santa Marta mountains. The SACC says - Sibley & Monroe (1990) and Ridgely & Tudor (1994), followed by Hilty (2003) and Fitzpatrick (2004), considered the South American improbus group of subspecies to be a separate species from Zimmerius vilissimus (Paltry Tyrranulet). Proposal badly needed. Traylor (1982) suspected that the subspecies parvus, from Honduras to NW Colombia, should also be considered a separate species. Golden-faced Tyrannulet Zimmerius chrysops: Seen at various loclaities. Variation in Golden-faced Tyrannulet subspecies is reasonably extensive and more than one species may be involved. Ridgely & Greenfield (2001) considered the subspecies flavidifrons of southwestern Ecuador and northwestern Peru to represent a separate species from Zimmerius chrysops based on differences in voice. Proposal needed. Ridgely & Greenfield (2001), Krabbe & Nielsson (2003), and Fitzpatrick (2004) also noted that the taxon albigularis from w. Ecuador and sw. Colombia might be a species distinct from Zimmerius chrysops. Yellow-crowned Tyrannulet Tyrannulus elatus: fairly common at various sites. Mountain Elaenia Elaenia frantzii: At Ibague and in Santa Marta. The subspecies we saw was pudica. The species was named after Alexander von Frantzius, a nineteenth century German collector in Brazil and Costa Rica. endemic to the Santa Marta Mountains. they are represented by the endemic subspecies galbinus. Pale-eyed Pygmy-Tyrant Atalotriccus pilaris: This tyrannid of dryer woodland, was seen nicely in the Minca area. Here the nominate race. on a couple of occasions ay Quinches. Black-throated Tody-Tyrant Hemitriccus granadensis: One in the Santa Marta mountains. of the endemic subspecies lehmanni. Black-headed Tody-Flycatcher Todirostrum nigriceps: at Minca. Slate-headed Tody-tyrant – Todirostrum sylvia - a few here and there. Common Tody-Flycatcher Todirostrum cinereum: Small numbers seen at various locations. Yellow-margined Tolmomyias – Tolmomyias assimilis The SACC says - Ridgely & Greenfield (2001), followed by Hilty (2003), considered populations of Central America and trans-Andean South America to represent a separate species, T. flavotectus; they restricted the name "Yellow-margined Flycatcher/Flatbill" to the latter and called the Amazonian species "Zimmer's Flatbill." Proposal needed. The latter is also likely to consist of more than one species (see Ridgely & Greenfield 2001). Fitzpatrick (2004) concluded that further research was needed before any changes are made to current species limits. Bran-colored Flycatcher – Myiophobus fasciatus fasciatus. The subspecies rufescens of arid western Peru and northern Chile was formerly (e.g., Cory & Hellmayr 1927) considered a separate species from Myiophobus fasciatus, but Zimmer (1939c) and Koepcke (1961) reported specimens that showed signs of intergradation between rufescens and M. f. crypterythrus (cf. Ridgely & Tudor 1994); thus, Meyer de Schauensee (1966) considered them conspecific, and this has been followed by subsequent authors. Jaramillo (2003), however, suggested that rufescens should be considered a separate species. Cinnamon Flycatcher Pyrrhomyias cinnamomea: Regularly encountered in the Andes (pyrrhoptera), and in the Santa Marta Mountains we saw the endemic and much brighter assimilis. Black-billed Flycatcher – Aphanotriccus audax A little known bird almost endemic to Colombia, but it does get into the Darien in Panama. We saw different indicidulas on two consecutive days at El Paujil. Vermilion Flycatcher Pyrocephalus rubinus: Small numbers seen at a number of sites. Slaty-backed Chat-Tyrant Ochthoeca cinnamomeiventris: We had very good views of the nominate subspecies above Ibague. Note that the form nigrita from the Merida Andes in Venezuela is sometimes split off as Blackish Chat-Tyrant O. nigrita and thoracica of southern Peru and Bolivia is generally split off as Chestnut-belted (or Maroon-belted) Chat-Tyrant O. thoracica. The SACC says - García-Moreno et al. (1998) suggested that the plumage and genetic differences between subspecies groups north and south of the Marañon should be recognized at the species level, with Ochthoeca thoracica the name for the southern species. Ridgely & Tudor (1994) reported that there are also vocal differences that would support this split. Ridgely & Greenfield (2001) and Hilty (2003) further recognized Venezuelan nigrita as a separate species from O. cinnamomeiventris, as done by Cory & Hellmayr (1927); see Zimmer (1937b) for the rationale for treating them all as conspecific based on plumage pattern, the treatment followed by Fitzpatrick (2004). Proposal needed. Yellow-bellied Chat-Tyrant Ochthoeca diadema: We had great looks at this around San Lorenzo where the subspecies jesupi is endemic to the Santa Marta Mountains. Flammulated Attila - Attila flammulatus. (Mexico south to Western Ecuador) – a potential split from Bright-rumped Attila. The SACC says - Leger and Mountjoy (2003) found major vocal differences between South American and Middle American populations of Attila spadiceus, strongly suggesting that at least two species are involved, but did not adequately sample populations from west of Andes in South America; these are vocally similar to the Middle American flammulatus group (P. Coopmans, pers. comm.). Proposal needed? than the bird was seen. Boat-billed Flycatcher Megarynchus pitangua: Small numbers. Rusty-margined Flycatcher Myiozetetes cayanensis: Numerous and widespread at lower elevations. Piratic Flycatcher Legatus leucophaius: Vocal and easily seen. Small but fierce, and so-called because of its habit of harassing other bird species in order to appropriating their newly finished nest for their own use. Gray-breasted Martin Progne chalybea: Reasonably numerous at lower elevations. Black-chested Jay Cyanocorax affinis: A smart bird seen at the El Paujil Reserve and in the Santa Marta Mountains. Inca Jay Cyanocorax yncas: A most handsome bird. Ridgely & Greenfield (2001) and Hilty (2003) treated Middle American populations as a separate species, C. luxosus ("Green Jay") from South American C. yncas ("Inca Jay"), but no data presented; they were formerly (e.g., REFS) considered separate species. Bicolored Wren Campylorhynchus griseus: A large and handsome wren, and a cousin of Central America’s Rufous-naped and Mexico’s Giant Wrens. Good shows at our lodge in the Cerulean Warbler Reserve. Rufous-breasted Wren Thryothorus rutilus: Godd looks below Mindo here of the race laetus. Speckle-breasted Wren Thryothorus sclateri * Here the isolated race columbianus, which may represent a separate species. Buff-breasted Wren Thryothorus leucotis: Another species that was pretty easy to see along the Caribbean coast where we saw the subspecies venezuelanus. Grey-breasted Wood-Wren Henicorhina leucophrys: Regularly heard at higher elevations with a number of good views. Tropical Mockingbird Mimus gilvus: An open country species. Slaty-backed Nightingale-Thrush Catharus fuscater: Seen on the San Lorenzo ridge. The endemic subspecies sanctaemartae is darker than most. Yellow-legged Thrush Platycichla flaviceps: Common in the Santa Marta Mountains and at Ocona where the subspecies is venezuelensis. Great Thrush Turdus fuscater: Ubiquitous at higher elevations. We saw quindio (endemic) in the Central and Western Andes, and cacozelus (a very pale subspecies that is also endemic) in the Santa Marta Mountains. Black-hooded Thrush Turdus olivater: A few on the San Lorenzo ridge at middle elevations in the Santa Marta Mountains, of the endemic race sanctaemartae. Pale-breasted Thrush Turdus leucomelas: Relatively common. Long-billed Gnatwren Ramphocaenus melanurus: One near Mindo showed well. Rufous-browed Peppershrike Cyclarhis gujanensis At least two seen. Red-eyed (Chivi) Vireo - Vireo (chivi) olivaceus: Some classifications (e.g., Pinto 1944) have considered the South American chivi group as a separate species ("Chivi Vireo") from V. olivaceus, or as conspecific with V. flavoviridis (Hamilton 1962), but see Hellmayr (1935), Zimmer (1941d), Eisenmann 1962a, Johnson & Zink (1985), and Ridgely & Tudor (1989). Ridgely & Greenfield (2001) suggested, however, that more than one species may be involved within the South American chivi group. Rufous-naped Greenlet Hylophilus semibrunneus: Small numbers of this distinctive, snazzy greenlet were recorded. Golden-fronted Greenlet Hylophilus aurantiifrons: Our best views were below Minca. resident of the montane forests. E Yellow-crowned Whitestart Myioborus flavivertex: We saw plenty of these delightful birds around San Lorenzo – it is one of the most conspicuous Santa Marta endemics. Slightly atypical for a Myioborus whitestart, being somewhat slow and deliberate in its movements and almost (Basileuterus) warbler-like in appearance. Rufous-capped Warbler Basileuterus rufifrons delatterii: Common above Ibague. The delatrii group of subspecies, from Guatemala south to northwestern South America, was formerly (e.g., Hellmayr 1935) treated as separate species from the Basileuterus rufifrons of (mainly) Mexico, but they evidently intergrade in Guatemala and Honduras (Monroe 1968, AOU 1983). Bananaquit Coereba flaveola: As usual, common and widespread. Golden Tanager Tangara arthus: A stunning montane species that we saw at a number of sites. Blue-necked Tanager Tangara cyanicollis: Common and widespread but nonetheless striking. deleticia in the Andes, and toddi in the Santa Marta Mountains, which is all grassgreen except for the bay head. The name ‘gyrola’ is derived from the Latin ‘gyros’, or ring, and refers to the golden nuchal collar present in most races of this species. numerous and widespread tanagers in Colombia’s valleys and on the adjacent slopes, but outside the country it is a localized speciality in northern Ecuador. E Santa Marta Mountain-Tanager - Anisognathus melanogenys: Another handsome Santa Marta endemic which was fairly common but great to see! from the ‘episcopal blue’ plumage. Palm Tanager Thraupis palmarum: Common and widespread. Rufous-crested Tanager – Creurgops verticalis. Guira Tanager Hemithraupis guira: A single male was noted in one of the feeding flocks at Amalfi. Common Bush-Tanager Chlorospingus ophthalmicus: Fialrly common. A species with a lot of geographic variation. Black-faced Tanager Schistochlamys melanopis: A single at Amalfi much to Carl’s delight! Bluish Flower-piercer Diglossopis caerulescens: A couple at the Cerulean Warbler Reserve. Flower-piercers are nectar thieves, as their name suggests piercing the flowers at their base without performing any pollination duties. White-sided Flower-piercer - Diglossa albilatera: Perhaps the most common and widespread of the flower-piercers. Here the nominate race. Yellow-tufted Dacnis - Dacnis egregia: 2 above Ibague and 4 near san Vicente. The SACC says - Ridgely & Tudor (1989) pointed out the trans-Andean egregia group may deserve species rank. Ridgely et al. (2001) considered egregia a species separate from lineata based on plumage differences and disjunct range. SACC proposal to recognize Dacnis egregia as a separate species did not pass because of insufficient published data. Orange-bellied Euphonia Euphonia xanthogaster: 3 seen at the Cerulean warbler Reserve and like most races, the birds we saw (oressinoma), are actually yellow-bellied. A species conspicuously absent from the (impoverished) Santa Marta Mountains. E Santa Marta Brush-Finch – Atlapetes melanocephalus 20 daily of the endeic and often in the lodge garden. Stripe-headed Brush-Finch Atlapetes torquatus: 2 above Ibague (lacking the black breast band) of the assimilis race and another seen in the Santa Marta Mountains, of the endemic race basilicus (which, along with several other subspecies, does have a black breast band). More than one species are likely involved. scientific name, this species having nothing to do with Angola – an error! Yellow-bellied Seedeater Sporophila nigricollis: Small numbers at several sites. Rufous-collared Sparrow Zonotrichia capensis: Numerous at higher elevations. Crested Oropendola Psarocolius decumanus: Easy to see at middle elevations in the Santa Marta Mountains. Great-tailed Grackle Quiscalus mexicanus: Fair numbers at Santa Marta town. Yellow-tailed Oriole Icterus mesomelas: A male of this attractive oriole showed well at Minca. Red-breasted Blackbird Leistes militaris: We saw two around the marsh near to our hotel at Dorodal..